A healthy looking smile is a bright one and makes a great first impression. For those who are looking to enhance their smile, Dr. James Rogge is happy to offer teeth whitening in Dover. Teeth whitening is one of the most sought after cosmetic dental treatments and can provide a lasting impact that can benefit patients for years to come. We provide several options for teeth whitening and will make recommendations on a case by case basis. At Walker Square Dental Associates in Dover, we know how important it is to look and feel your best, and that's why we're proud to offer our patients industry-leading whitening solutions. Patients love the results they get from the Philips Zoom in-office treatment and from the Philips Zoom NiteWhite and DayWhite take-home solutions. Our in-office treatments provide dramatic whitening results in minimal time. Patients leave the dental office with teeth up to 8 shades whiter in a single appointment. The Philips Zoom in-office treatment is a great solution for patients in search of fast results. The procedure involves the application of a specialized gel to the surface of the teeth. 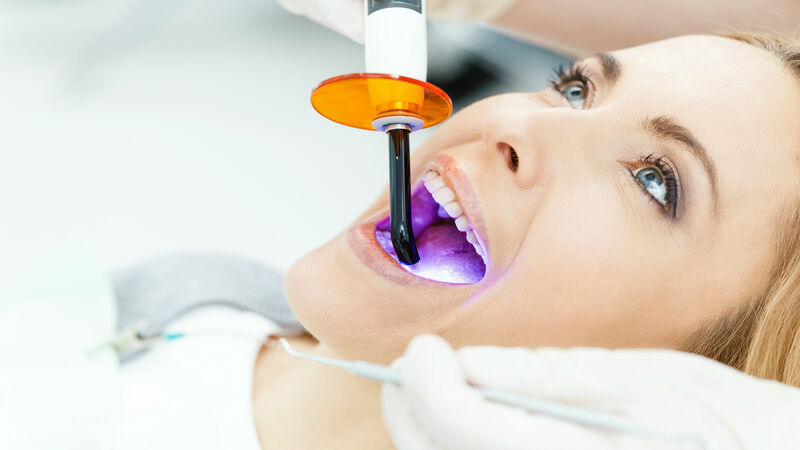 A halide "Zoom" light is then shone on the teeth, activating the gel and initiating the whitening process. A standard in-office treatment involves three gel applications and may require several successive sessions with the dentist in order to achieve the desired result. In-office treatments, in many situations, are painless for the patient, though some may experience heightened tooth sensitivity following the treatment. For these patients, the use of a fluoride desensitizing agent is recommended. Patients who have exposed roots, due to recessed gum lines or gum disease, should forego the in-office treatment, and instead consider the less intense NiteWhite and DayWhite take-home solutions. Dover-area residents interested in effective take-home, teeth whitening solutions will find the industry’s leading solutions available at Walker Square Dental Associates. Philips’ NiteWhite and DayWhite products allow patients to control the pace of their tooth whitening. The results obtained are essentially the same as those gained through the in-office treatment and will always vary from patient to patient. Take-home whitening treatments begin at the dentist's office and usually require two visits. During the first visit, impressions (molds) are made of the teeth to aid in the creation of form-fitting plastic trays. During the second visit, the trays are tried on and a proper fit ensured. Afterwards, the patient takes the trays home, applies a special whitening solution, and wears them either twice a day for 30 minutes, or overnight for a few weeks. Depending on the severity and type of the discoloration, the take-home whitening process can require anywhere from a week to a month to reach the desired result. The first step to a whiter, brighter smile begins with a personal in-office consultation with your dentist at Walker Square Dental Associates in Dover, DE, so make your appointment today! We look forward to seeing you!